My name is Matt Winick from Ann Arbor, Michigan and I have a strong interest in learning history including social justice. In these subjects, I like to learn the need for Civil Rights to be stronger to reduce discrimination, protect the environment from pollution, and many others. 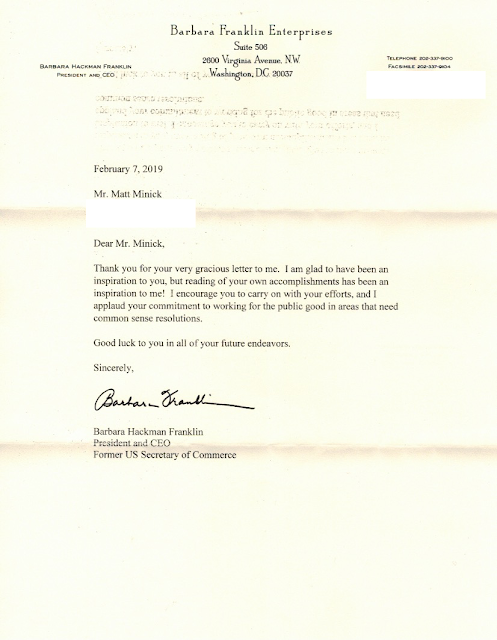 Honorable Franklin, the main reason I’m writing you a letter is to explain how I find your work when you served as commissioner of the Consumer Product Safety Commission, 29th U.S. Secretary of Commerce and as a moderate Republican to be very inspiring to me. When you served as a commissioner of Consumer Product Safety Commission from 1973-1978, I was very proud on how you worked with President Richard Nixon, Gerald Ford, and Jimmy Carter to find ways to improve product safety. Also in your role as commissioner of Consumer Product Safety Commission I liked on how worked with President Jimmy Carter to help create U.S. Regulatory Council to work with different agencies like the Occupational Safety and Health Administration, the Environmental Protection Agency, and the Food and Drug Administration to research along with regulate carcinogens. In 1992, I liked on how you accepted President George H.W. Bush to be nominated to serve as U.S. Secretary of Commerce to help him improve our country. 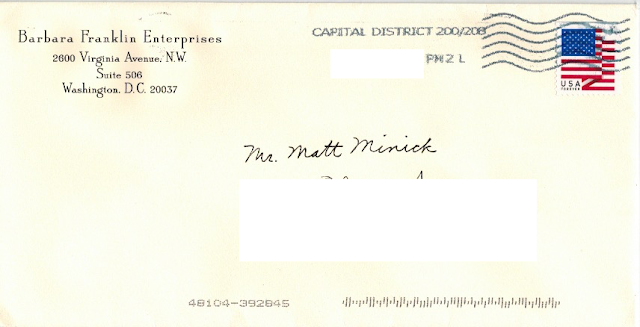 When you served as 29th U.S. Secretary of Commerce from 1992-1993, I liked on how you were a strong supporter of Civil Rights by advocating for people with disabilities rights, supporting funds to help women including minorities businesses to help them compete in the economy, and working with President George H.W. Bush to help continue to improve Civil Rights legislation to help protect women, minorities, and people with disabilities from being discriminated in education and public places. To improve public safety, I liked on how you worked to push for some regulations like expand laws to make sure that products are safe for people to use when they come from other countries, encourage companies to make products environmentally friendly to reduce pollution, and push for tough laws when companies illegally use dangerous chemicals in the products. After you left public service, I liked on how you continue to be a moderate Republican on supporting Civil Rights including people with disabilities’ rights to reduce discrimination, advocate for consumer safety, express the need for immigration reform to help protect immigrants including refugees from being oppressed, and support environmental protection. Honorable Franklin, I have autism with a learning disability. Having a disability is hard for me because I have trouble comprehending on learning different advance subjects, sometimes I struggle to communicate my thoughts, and get teased. Your commitment to be a strong supporter of Civil Rights including people with disabilities’ rights really inspires me to work hard on my disability. Also I visited The Gerald Ford Presidential Museum, The Jimmy Carter Presidential Museum, and The George Bush Presidential Museum and I enjoyed learning about your work in the these presidential administration and how you helped them on improving our country. Your role as commissioner of Consumer Product Safety Commission, as 29th U.S. Secretary of Commerce, and as a moderate Republican gives me motivation to continue to learn history including social justice. My future goal is to someday work in these areas to help emphasize the need to make Civil Rights stronger to reduce discrimination, protect the environment from pollution, have immigration reform to help protect immigrants including refugees from oppression, and many others. I strongly believe that you made a great difference for public service. I’m proud on how you worked with President Gerald Ford, Jimmy Carter, and George H.W. Bush to help improve our country on Civil Rights, environmental protection, consumer safety, and public safety. Also I like on how you are a moderate Republican on continuing to advocate for Civil Rights, environmental protection, and many others when the GOP gets too extreme. You have inspired me to work hard on my disability, visit the presidential museums to learn about your work, and be motivated to continue to learn history including social justice. Thanks for taking the time to read my letter, working hard to make a great impact on society, and inspiring me. I wish you the best to continue to advocate with push for common sense ideas.